When you're choosing a college, it’s not just majors, classes and activities that will determine the quality of your educational experience. Quality of life is also a major factor for how you will learn and grow during the undergrad experience. Along with dining (from coffee shops to fresh and fast Mexican!) and recreational facilities (from a climbing wall to a lap pool! 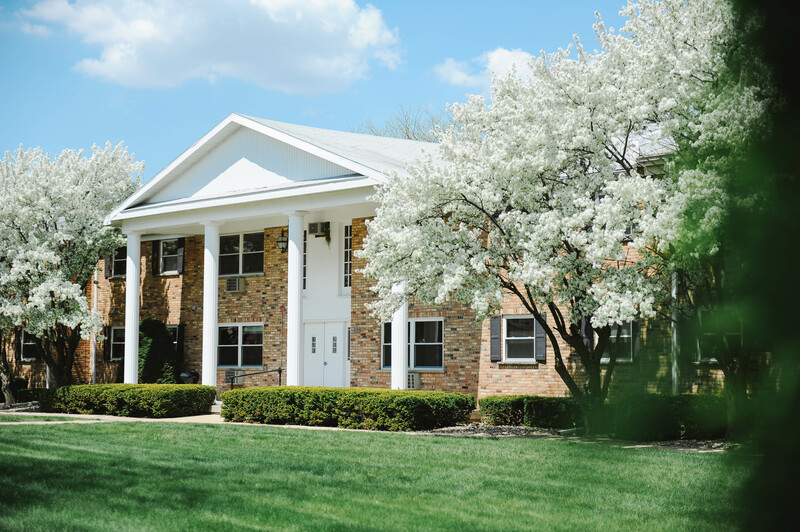 ), residential life is one of the highlights of the Olivet experience. 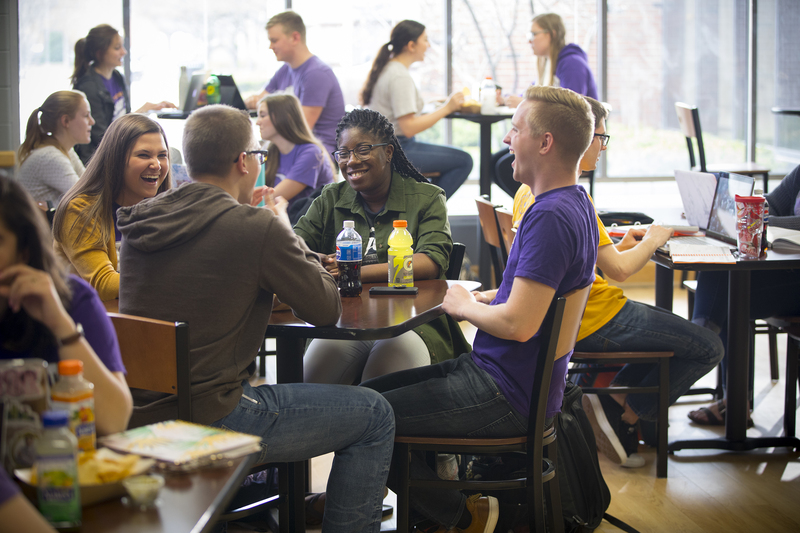 At Olivet Nazarene University, we know comfort, security and fun are all essential ingredients to bring out your best as a college student. Freshmen and upperclassmen study, relax and build lifelong friendships in a variety of housing settings. 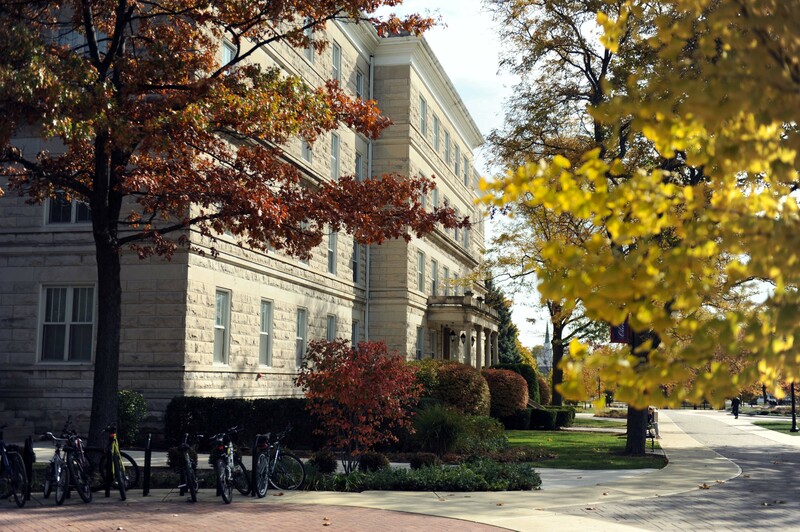 Living on campus is one of the highlights of the ONU experience. Sharing and learning together, hanging out and having fun together — this is how close friendships and lifelong memories are formed. 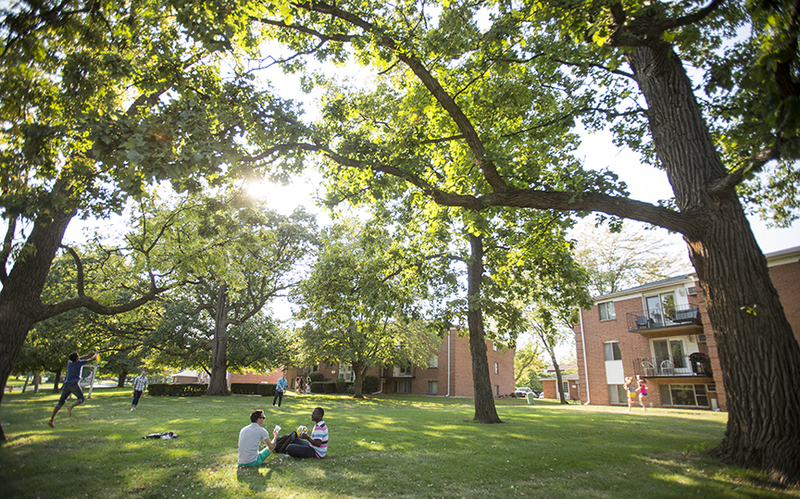 Olivet is a close-knit, Christian living community, where students grow socially, academically and spiritually together. Resident directors and resident assistants live within our student residence halls, providing guidance and support, ensuring a positive living experience for every student. We are so convinced of the merits of campus living that we maintain a residential campus policy requiring students 22 years or younger to live on campus unless the student is a commuter. We believe campus living has a vital, life-changing impact, and we want it to become a part of every student’s Olivet experience. After completing their undergrad experience, many ONU alums look back at the first two semesters as the most vital in cementing social connections, starting down the right career path and discovering their God-given passions. Housing approximately 220 students, Williams Hall offers plenty of opportunities to create connections. Williams is a four-story building with a large common lounge on the entry-level floor. Williams has traditional two-person rooms (11 x 14), and also a limited number of three-person rooms. Four suites are available, which are two rooms connected by a private bathroom. Each room has one window (40"w x 53"l). Laundry facilities are available in the lower level, near the full-size kitchen. Microwaves are not allowed in individual rooms, but one is provided in the kitchen on the first floor. Chapman, one of the freshman men’s dorms, embodies the quintessential higher ed architecture captured in classic film and television. With its spacious rooms and high ceilings, Chapman Hall is home to approximately 200 freshman male students each school year. A four-story building, Chapman Hall is a legacy on Olivet’s campus. Chapman Hall has a lounge on the entry level, equipped with a big screen TV and comfortable seating to gather with your new classmates. Chapman has its own laundry facilities and vending machines for a late-night snack. Community restrooms and shower facilities are located in the middle of each floor. Two-person rooms are 11' x 18', and three-person rooms are 11' x 24'. Parrott Hall is a residence for freshman female students with the capacity to house approximately 190. It is a traditional residence hall with two-person rooms (11' x 11') and a community bathroom in the middle of each floor. Rooms have two windows (35"w x 54"l). All rooms are tiled. This hall has a common lounge with a kitchen on the first floor and laundry facilities in the lower level. Microwaves are not allowed in individual rooms, but one is provided in the lobby kitchen. Located on all four floors are community restrooms, showers, study area and a small utility area furnished with a kitchen sink and ironing board. A chapel is located on the second floor, and a TV room on the third floor. Vending machines are located on first floor, north stairwell. Laundry facilities are located in the lower level at the south end of the building. Nesbitt Hall is a great place to live and a cool place to eat! 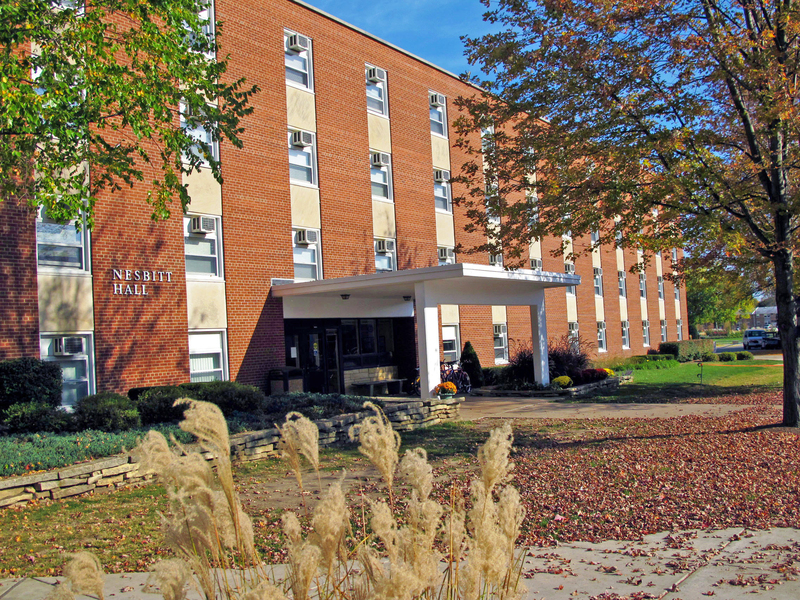 Nesbitt Hall is a male residence hall housing 150 freshman students. It is a traditional dormitory with two-person rooms (10' x 14') with one window (51”w x 63”l). Community bathrooms are located in the middle of each floor. Each floor contains laundry facilities. TV and/or study rooms are found at various locations throughout the building. The lobby of Nesbitt houses Café a la Cart, a dining area open during the lunch hours to all students. This dining area offers a flat screen television and computers for lunch-goers and Nesbitt residents. Nesbitt’s four-story building offers easy handicap access. Hills Hall is a residence hall for male students, housing over 190 upperclassmen. It is a traditional residence hall with two-person rooms (11' x 11') with two windows (36.5" x 64"). All rooms are tiled, with the option of laying temporary carpet. Community bathrooms are located in the middle of each floor. TV and/or study rooms are found at various locations throughout the building. A kitchen and dining area are two of the highlights of Hills’ larger common area. Howe Hall, for female upperclassmen, has two-person rooms (11'6" x 20') with a bathroom in each room. Each room is tiled with an option for placing temporary carpet. Howe’s lounge area is centered between the two wings with a kitchen area located in the corner. The kitchen has a refrigerator, oven, microwave and sink. Beyond this, cooking is not allowed in the residence hall. Laundry facilities are located just off the lobby. McClain Hall, a residence hall for female upperclassmen, has the capacity for approximately 190 students. It is a traditional residence hall featuring two-person rooms (11 x 14) with two windows (35"w x 53"l). Floors are tiled with an option to bring carpet for the school year. Located on all four floors are community restrooms, showers, study area and a small utility area furnished with a kitchen sink and ironing board. Microwaves are not allowed in individual rooms, but one is provided in the lobby kitchen. There is a dorm chapel located on the second floor and a TV room on the third floor. McClain Hall has a formal, air-conditioned lobby with TV, kitchen, pop machine and public restrooms. Additional vending machines are located in the first floor north stairwell. Laundry facilities are located on the lower level at the south end of the building. In addition to residence halls for upperclassmen, we also offer spacious apartment complexes to upperclassmen. Grand, University Place and Stadium Apartments are all located on the perimeter of the campus. Olde Oak and Stratford Apartments are located off campus. These 3- or 4-person living quarters all have their own bathroom, kitchen, living room and bedroom(s). Laundry facilities are available in each complex.